Water quality is central to the integrity of the environment and determines the suitability of water for a particular purpose e.g. community drinking water supply, recreational or agricultural purposes. Nutrient, sediment and other contaminants run-off from land, impacts on the receiving freshwater, estuarine and marine ecosystems (Department of Sustainability, Environment, Water, Population and Communities, 2013). The Burdekin region is a priority area for nitrogen (focused on the Lower Burdekin and Haughton), pesticides and sediments entering the GBR World Heritage Area. The rural areas are the largest contributors in our region with 78.2 per cent of sediments coming from grazing land and 86.4 per cent of nitrogen load coming from sugarcane lands, see pie charts below.The GBR fringes the coast of our region and its extraordinary biodiversity is recognised internationally through its status as a World Heritage Area (listed in 1981). The major threats to the health of the GBR are climate change, poor water quality and coastal development (Great Barrier Reef Marine Park Authority, 2014). Increased sediment, nutrients and pesticides runoff from agricultural land uses are the greatest cause of declining water quality on the GBR (Great Barrier Reef Marine Park Authority, 2014). The Burdekin region is a priority area for nitrogen (focused on the Lower Burdekin and Haughton), pesticides and sediments entering the GBR World Heritage Area. 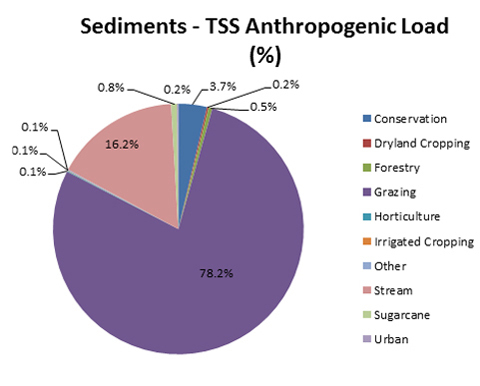 Agricultural activities are the largest contributors to anthropogenic loads in our region with 78.2 per cent of sediments coming from grazing land and 86.4 per cent of nitrogen load coming from sugarcane lands, see pie charts below and Burdekin WQIP 2016. In addition to sediments and nutrients, marine debris is a threat to habitats and wildlife in our region. Please refer to the Biodiversity section for information on marine debris in the Burdekin. The Australian and Queensland Governments have adopted a collaborative approach to managing water quality issues in the GBR with the establishment of the Reef Water Quality Protection Plan (Reef Plan) in 2003, revised in 2009 and 2013, and more recently, the Reef 2050 Long-Term Sustainability Plan (Reef 2050 Plan). 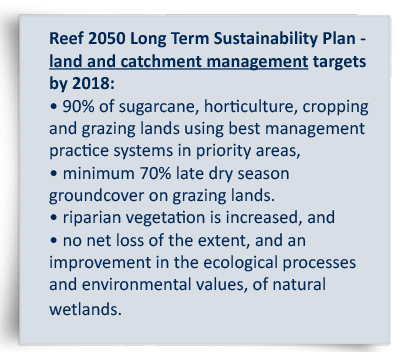 The timeframes associated with targets detailed in these plans will require focused effort and targeted investment over the next five to ten years from a wide range of stakeholders, including government, industry bodies, regional NRM groups and the wider community. research for knowledge gaps and science synthesis. Water quality objectives, known as Environmental Values (EVs) are set and managed to protect specific ecologically-relevant qualities of waterways from adverse impacts, to ensure ecosystems are healthy and the water is safe for community use. The EVs for our region, have been identified for freshwater, estuarine and marine areas in collaboration with community stakeholders, Local Government, State Government and the Great Barrier Reef Marine Park Authority (GBRMPA) (Department of Environment & Heritage Protection, 2013b). Two WQIPs cover the Burdekin Dry Tropics region – the Burdekin WQIP and the Black Ross (Townsville) WQIP. These plans synthesize the best available water quality science and guide future investment for water quality improvement in the region. The Black Ross (Townsville) WQIP area covers most waterways within the Townsville City Local Government area. The WQIP identified urban diffuse pollutant sources as the greatest overall contributors to water quality issues, as well as significant impacts from point source pollutants in the Black River, Bohle River and Stuart Creek catchments. 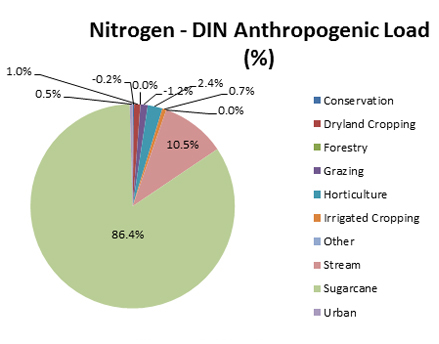 Overall for the Black Ross region, 50 per cent of the waterways have achieved the total nitrogen and total phosphorus WQOs, and only 33 per cent have achieved the total suspended solids WQOs (Gunn & Manning, 2010). Principal pollutants of urban areas include sediments, nutrients (principally nitrogen and phosphorus), oxygen-demanding materials (biodegradable organic material), metals, toxic organic wastes (garden and household chemicals), pathogenic micro-organisms (bacteria, viruses etc. ), hydrocarbons and litter (Gunn & Manning, 2010). Wastewater treatment plants are significant point source pollutant emitters in the urban area. Most of the existing treatment plants discharge into freshwater, estuarine or marine receiving water, with the Cleveland Bay Wastewater Treatment Plant being the largest emitter (Gunn & Manning, 2010). An upgrade of the plant is proposed to accommodate a greater future population, and reduce nutrient discharge to waterways in the short-term, however, it will inevitably increase overall nutrient loads as waste volumes increase with predicted population growth. The Black Ross WQIP identifies a wide range of water quality improvement actions across urban, peri-urban and rural areas, including establishing a Total Water Cycle Management Plan (TWCMP) linking stormwater, wastewater, potable water and waterway management. For more detailed targets and outcomes refer to the Black Ross (Townsville) WQIP . The Burdekin WQIP 2009 was updated in 2015-2016 with the latest scientific data and information. It was also expanded to cover urban as well as rural areas and to cover all catchments in the Burdekin Dry Tropics region; linking to the Black Ross (Townsville) WQIP and including the Don River catchment. The Burdekin WQIP identifies eight catchments comprising water resources in various conditions, and a range of current land management practices. Distinct areas of land use occur in our region: grazing in the upper catchments, grains in the Suttor, horticulture in the Don and irrigated sugarcane cropping in the Lower Burdekin. Each land use raises different water quality concerns, priorities being erosion from grazing lands causing high loads of fine suspended sediment, and irrigated cropping lands in the Lower Burdekin associated with high levels of dissolved nutrient loads and significant levels of herbicide loads in freshwater and coastal ecosystems (Brodie, et al., 2013). The Burdekin WQIP (2016) identified grazing land areas in the Bowen Broken Bogie, Lower Burdekin and Don catchments as contributing significantly to gully, stream bank and hillslope erosion: Bowen River, Bogie River, Pelican Creek, Little Bowen River, Burdekin Delta, Burdekin River (below dam), Glenmore Creek, Rosella Creek and Don River sub-catchments (Waterhouse, et al., 2016) . Many of these areas are considered to be in poor land condition (refer to Land section). Tracing data indicates that the Upper Burdekin and Bowen Broken Bogie catchments have the highest rate of kilograms per hectare erosion derived from exposed subsoils, highlighting a significant loss of fine sediment into the waterways (Lewis, et al., 2015). The WQIP promotes increasing the community’s capacity to implement best management practices to reduce hillslope, stream and gully erosion, by maintaining, improving and restoring river frontage, and soil and pasture condition. For sugar production lands the WQIP also promotes reducing excess irrigation, nitrogen surplus and herbicide losses. 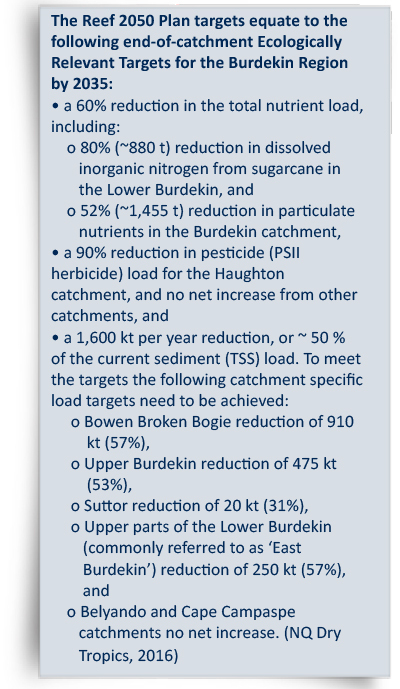 For more detailed targets and outcomes please refer to the Burdekin WQIP. The most recent 2014 Reef Report Card identified that our region has made substantial progress towards the Reef Plan targets. 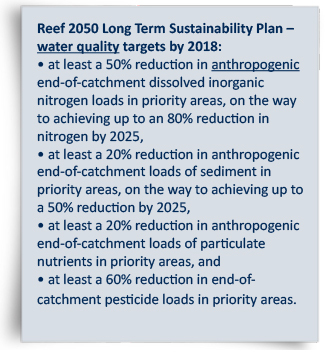 The Paddock to Reef Program modelling predicts that we have made moderate to very good progress toward load reduction targets for our region’s main pollutants of nitrogen, phosphorus, sediment and PSII herbicides (Queensland Government, 2015). Between 2008 and 2013 the following reductions in anthropogenic loads (estimated using the Source Catchments modelling by Dougall, et al., 2014) were estimated for the Burdekin Region: Total suspended sediment (TSS) 16 per cent, Dissolved Inorganic Nitrogen (DIN) 14 per cent, Particulate Nitrogen (PN) 14 per cent, Particulate Phosphorus (PP) 15 per cent and photosystem II inhibiting herbicides (PSII herbicides) 13 per cent (NQ Dry Tropics, 2016). Further reductions have also been estimated between 2013 and 2014 (Queensland Government, 2015), but not enough to meet the Reef Plan 2018 targets. In our region, the existing significant collaborative effort, backed by investment, to achieve the management targets for the Burdekin catchment, include applying improved land and water management techniques similar to practices mentioned in the Land section, managing stocking rates to maintain groundcover, remediating gully erosion, adjusting crop applications, minimizing nitrogen surplus and modifying irrigation practices. Adopting these best management practices has reduced the load of nutrients and sediments in runoff as well as improved land condition and farm productivity. The up-take of sustainable practices will increase as people become confident with new information and farming methods. However investment and support is required to maintain the momentum to achieve the long-term results.